When you are walking around St Tropez, you are faced with any number of boats and yachts of all shapes and sizes. My preference is for the sailing yachts although I don’t sail myself. I love their lines and simple elegance, the ropes, pulleys and polished wood, but they are not much in evidence in the harbour unless there is some yachting event taking place. Mostly the central part of the harbour is full of what I call “monstrous lumps of white plastic”. They are simply huge, worth millions no doubt, but really not that pretty. 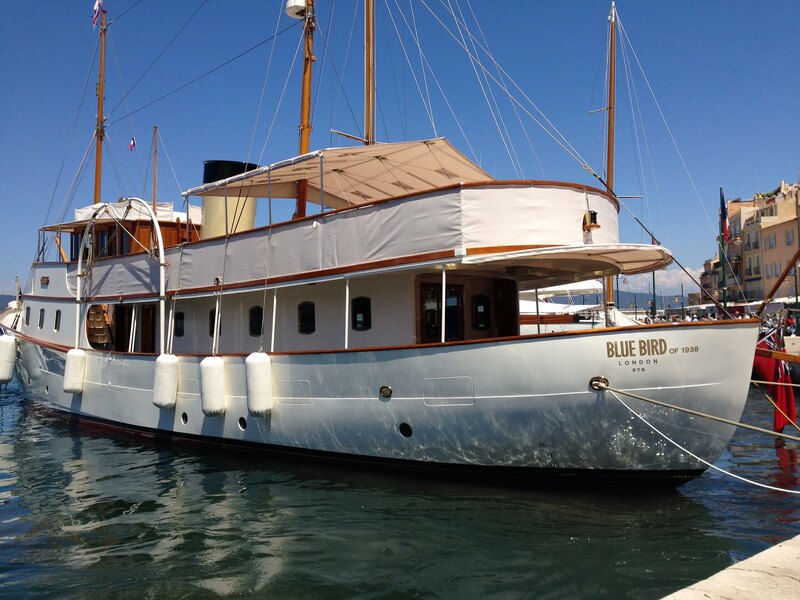 So I was quite surprised to see this boat moored up out of the way – Blue Bird of 1938. It looked the sort of boat that Poirot would go up the Nile in- it even had a proper stack! So interested was I, that I investigated further and found out that it is quite an historic boat, with an interesting tale to tell. She was launched in 1938 for as you might have suspected, Sir Malcolm Campbell, as Blue Bird IV and was intended to take him treasure seeking in the Pacific. That never happened and it was requisitioned in 1940 to assist in the evacuation of Dunkirk, and continued in service until after the war. By then Sir Malcolm was too old for long voyages and it was sold after his death. It soon became the property of Jean-Louis Renault – the French car manufacturer and he cruised in her all over the Mediterranean. Further adventures took her to Long Beach, California, then back to UK and also Rotterdam. She was eventually bought by “an English gentleman” who sought to refurbish her, but she was in fact almost completely rebuilt and refitted very tastefully with money being no object clearly. She won the Superyacht Award of 2008 for being an exceptional work of reconstruction, and is considered to be transformed into better than new condition, incorporating all the amenities and comforts of modern life. Since 2007 she has cruised around the Mediterranean and a quick internet search for images of her soon show her popping up in all sorts of locations. This photograph was taken on June the 4th and today as we write this “Blog a Pic” it is off the coast of Italy! Now that’s what I call a boat, a boat I could really love! Categories: Blog A Pic, iPhone, Photo Blog | Tags: Bluebird, yacht | Permalink.